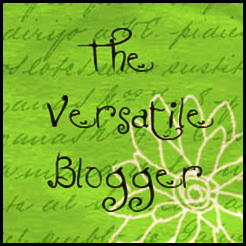 I have been given the Versatile Blogger Award by Krista at I Take the Pen. Yay!!!! Now, I get to pass it on! Thank the person who nominated you. Tell 7 things about yourself, so that your readers may learn more about you, and nominate 15 other newly discovered bloggers, then let them know you nominated them. 1. Tennis is my favorite sport! I am glued to my TV during any of the grand slams, and any time I can catch a Federer, Clisters, or Isner match. I also enjoy playing, quite badly, every chance I get. 2. A little over a year ago I moved to the beach, and this past summer I started paddle boarding. It is so much fun being out far enough to see the awesome creatures swimming around in the ocean up close. But, not too close! 3. 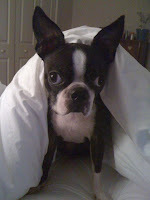 I have a Boston Terrier, named Duke. He is firmly of the mind that he is in charge of our relationship, all 16 lbs of him, but pull out a tasty treat and he’ll do just about anything. 4. I get antsy when it’s too quiet. My favorite background noise is Ray Lamontagne, Andy McKee, Adele, and Grace Potter, but I will listen to almost anything with a tune. Singing loudly in my car, pretending I can carry my own tune, makes me look forward to driving to work. 5. This past March, I finished my first novel. It’s a romantic suspense set on Amelia Island, and I am constantly going back to edit it and thinking about editing it. Does this feeling ever go away? 6. I love receiving cards. I look forward to the card just as much as the gift on holidays. There is a box in the top of my closet filled with every card I’ve ever been given, organized by occasion. Because of my serious addiction, I spend hours in the greeting card aisle each time I get the chance to give a card to someone. 7. Earlier this year I took up quilting. Prior to that, I had never so much as sewn a button on a shirt. Now, I’m addicted to finding new patterns and fabrics. Christmas quilt I'm working on. Thanks so much Lillie, really lovely to think someone enjoys reading my blog! I've never heard of a greeting card obsession! Thank you so much! I feel so honored, and happy. I just want to start jumping up and down!!! Thank you so much Lillie! You know I have secretly coveted this award. shhhh... don't tell anyone. Love the little tidbits you shared. Your dog is adorable. I am also a fan of Ray Lamontagne and Adele! !